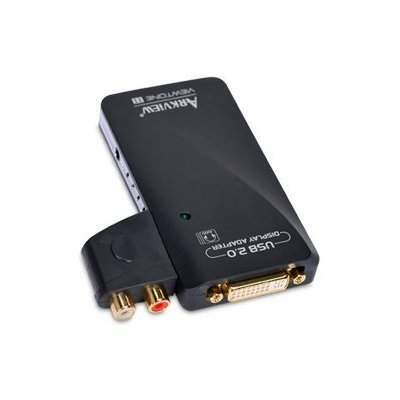 The USB 2.0 to DVI/VGA or HDMI Adapter enables you to connect up to 6 monitors, LCD's, TV's or projectors to your PC or notebook. You can use it as an extended desktop or as a larger/different display from your main screen. By using USB 2.0 technology, there is no need to open the computer or struggle with compatibility issues related to a second VGA card. Extending your desktop has never been easier with the USB 2.0 to DVI/VGA or HDMI Adapter! Install the included software, plug in the adapter, and you are on your way to dual monitor computing. Now you can easily expand spreadsheets over 6 monitors, read e-mail on one monitor and view the attachment on the other, make multi-screen presentations without a second computer, or expand your graphics workstation or mirror your monitor. The USB 2.0 to DVI/VGA or HDMI Adapter is perfect for laptop users who don’t have the capability of adding an extra video card. It is also a cost-effective solution for desktop users who don’t want the hassles of installing an internal video card. USB 2.0 technology allows you to use this device with numerous computers versus an internal card that can only be used with one. Since this adapter is bus-powered, no additional power cables are needed. Whether you want to use the USB 2.0 to DVI/VGA or HDMI Adapter with your laptop or with your desktop, you’ll enjoy the ease of use and quality of picture this device delivers.